32 Amp, four core. 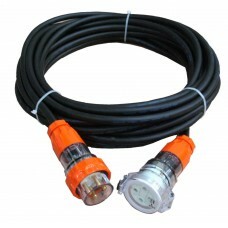 Australian Standard Light Duty Industrial Extension Leads. These 32 Amp 4 Core Light Duty Extension Leads. Recommended for indoor use or for short duration outdoor applications where the ambient temperature is below 40°C.